The first shield for California 265 stands along North Weed Boulevard (Business Loop I-5) just beyond the diamond interchange (Exit 748) with Interstate 5. 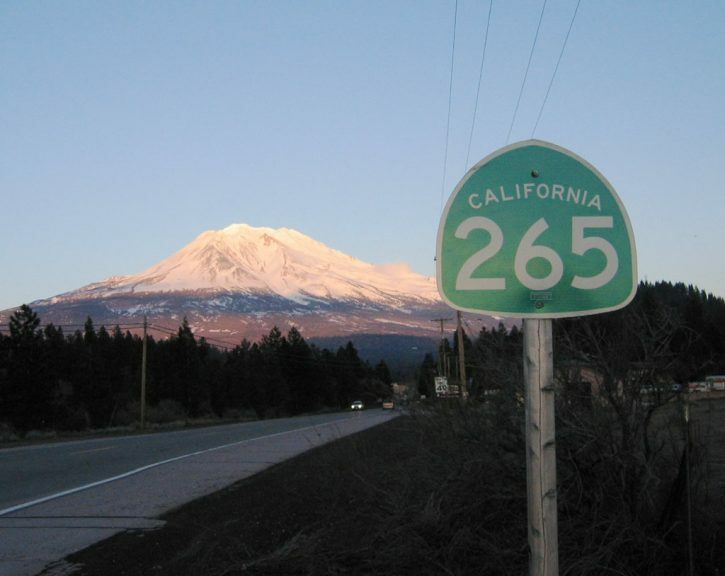 Mount Shasta provides a magnificent backdrop for this short state route. Photo taken 04/01/05. California 265 is the northern portion of Business Loop I-5 in Weed along old U.S. 99 (North Weed Boulevard). The remainder of the business route on South Weed Boulevard is not part of California 265. The middle section is a part of U.S. 97, while the portion south of College Street it is part of U.S. 97. North Weed Boulevard (SR 265 & Business Loop I-5) north defaults onto the northbound on-ramp for Interstate 5 to Medford and Portland, Oregon. The state route concludes at the southbound on-ramp across from Chaparral Drive to the left. Old U.S. 99 extends along Edgewood Road to the north. Photo taken 04/01/05. Business Loop I-5 and California 265 originate from the southbound off-ramp (Exit 748) from Interstate 5 to North Weed Boulevard. The two routes pass under the freeway north from Chapparral Drive. Photo taken February 1999.
Business Loop I-5 & SR 265 turn east onto North Weed Boulevard (Historic U.S. 99) at Old Edgewood Road and the northbound on-ramp for I-5 to Yreka. Photo taken 04/01/05. A reassurance marker for SR 265 follows as North Weed Boulevard parallels I-5, the CORP (Central Oregon & Pacific) Siskiyou rail line and Boles Creek east into Weed. Photo taken 04/01/05. This sign stating "Weed Like to Welcome You" precedes the city business district along North Weed Boulevard. The 4.8 square mile city was incorporated as a general law city on January 25, 1961. Photo taken 04/01/05. California 265 ends at the intersection with U.S. 97. U.S. 97 ventures north to Dorris and Klamath Falls, Oregon while the route south becomes an unsigned counterpart along Business Loop I-5 & Historic U.S. 99 along South Weed Boulevard. Photo taken 04/01/05. California 265 concluded without an end sign at a three-way stop sign with U.S. 97 north. This intersection was reconfigured by 2011 so that the through movement is along U.S. 97. It is now signalized. Photo taken 04/01/05. February 1999 by Jim Maffrand. 04/01/05 by AARoads.